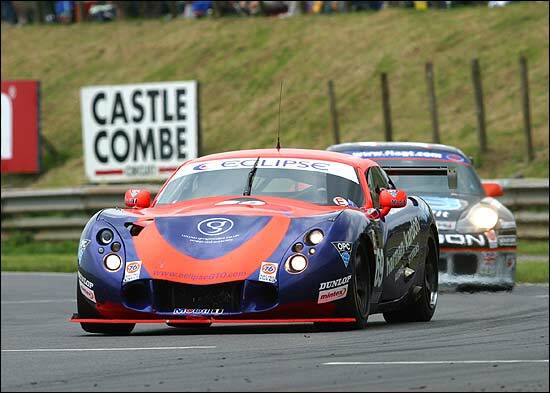 Castle Combe on June 22 promised much but delivered only disappointment for Eclipse Motorsport. A huge crowd and fantastic weather could have provided a stage for the team to build on their fantastic victory at Silverstone. As it was a shambles of a race left the team chasing points and a dreadful stroke of bad luck left the #69 TVR badly damaged. It all started well however. 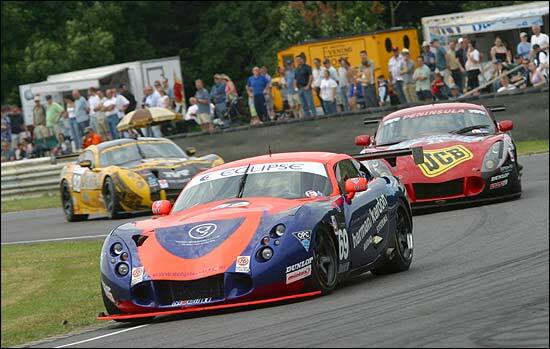 An already strong GTO entry was boosted by the two factory TVR T400Rs fresh from Le Mans and the returning Eurotech Porsche. With the Mosler pair, the three regular T400Rs and the Corvette, that could have meant a nine car tussle at the head of the race. The early signs were good, #69 was well up with the pack in the Saturday free practice session in amongst a gaggle of seven cars within a second of each other. 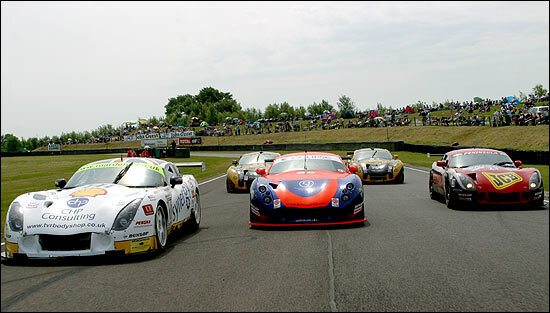 Qualifying on Saturday was better still, Piers Johnson hustling the car around the dauntingly quick Wiltshire circuit just under half a second slower than the polesetting Mosler of Martin Short. Sadly though it was still bettered by the other Mosler and by both of the factory TVRs. This was shaping up to be a firecracker. Sunday lunchtime and it was time to entertain the crowds. dailysportscar had arranged for all five T400Rs to be displayed on track for the assembled TVR Car Club faithful – this the first occasion when all five race cars had been assembled together. The response was stupendous, applause all the way around the circuit and a symphony of air horns at Tower bend from the TVRCC. There was a real buzz around the race itself and the action from the off didn’t disappoint. The build up had suggested that a TVR would push the Moslers hard, but there had been something of an assumption that it would be a factory car doing the pushing. Shane Lynch had other ideas however, and by the first flat out right hander he had powered by the two yellow and black T400Rs to grab third: orange and blue is evidently faster as well as better looking! Shane is rapidly getting as good a reputation as Justin Wilson as a demon starter – the critical difference however is that Shane races in a series where the overtaking is generally done on the track rather than the pitlane. Battle was joined. And what a battle it was. At the head of the field Tom Herridge had the lead in the #22 Mosler, with Shaun Balfe trying everything to get by. 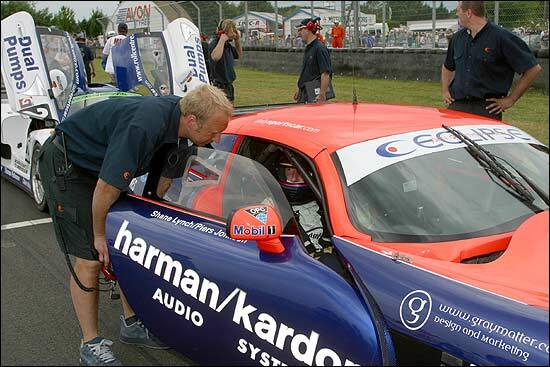 Shane was next up in what rapidly became a six car train, the Moslers plus our man, hotly pursued by the two DeWalt cars, split by a charging Graeme Mundy in the #23 Race Sport Salisbury TVR. It was going to get tougher still though for Shane as a warning light (and a wisp of smoke or two) in the cockpit of #69 gave cause for concern. Rob Barff in the #91 TVR took advantage, he grabbed third and Shane now found himself fending off Mundy. This race was fully alight, the first six cars separated by just 0.9 seconds and the crowd was loving every minute of it. With Shane still distracted by his dashboard warning lights, the Lynch / Mundy combo was fully engaged. Mundy took advantage of the Irishman’s worries at the start of Lap 9. He lined up #69 over the start / finish line and then passed it at the first turn, the #23 car almost fully on the grass to complete the move and up to fourth position, #69 down to fifth. Fifth would soon become fourth however as the Moslers would soon gift the chasing pack an advantage. Balfe was looking for a way by Tom Herridge, and there was contact between the two in the Esses. It would eventually lead to the #33 car’s retirement for the second consecutive race. Herridge too pitted for a puncture and all of this left an astonishing TVR 1,2,3,4 at the head of the pack after just 12 minutes of racing, the TVR Car Club contingent at Tower corner was clearly delighted! First non-Blackpool built car was one of Stuttgart’s finest, Mark Sumpter charging from the back of the grid in the #74 Eurotech Porsche. Sumpter would grab fourth position next as Shane pitted for a rapid investigation of his dashboard alarm. John Griffiths was happy that it was simply a rogue reading and the Irishman howled out to chase back the ground he’d lost, now back in seventh spot. With just 90 seconds to the opening of the pit ‘window’ Graeme Mundy’s fine run came to an end. He was still pushing very hard chasing the flying Rob Barff when changing down from fifth to fourth for the quick Tower bend he briefly found neutral. It was enough to lose the fine balance needed for cornering with total commitment and the results were horrifying: he lost the back end and slammed with barely abated speed front end first into the barrier. The front of #23 was heavily damaged, the race over on the spot for Mundy, mercifully though without injury. With the tyre barrier at Tower in total disarray and the TVR in a dangerous position the Safety Car was deployed almost immediately, but it just failed to pick up the leader and so started a chain of events that was to leave everybody utterly perplexed. The train of cars behind the SEAT safety car was somewhat confusing, the leader emerging from pitlane ninth in the train and with no attempt seemingly being made to wave cars by to preserve the status quo. Before long though it was clear that this would be a long clear up job and, for the first time since Oulton Park in 2002 the race was red flagged (after 27 minutes). The decision was reached quickly that there would be a restart for a 20 minute run to the flag, the race being decided on aggregate time of the two legs. Confusion and controversy reigned however over the grid order for the second leg. 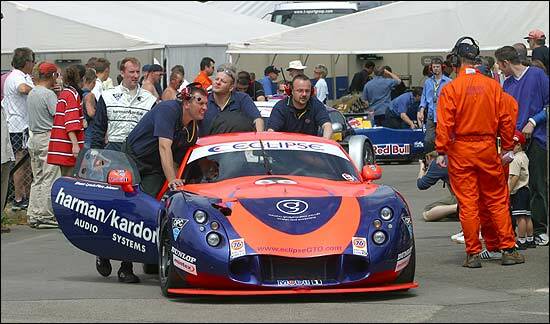 The Eclipse TVR was one of several cars which had effectively lost a lap owing to the poor positioning of the safety car. Ahead of it there were just three cars on the lead lap, both DeWalt TVRs and Tom Shrimpton in the Glenn Eagling Motorsport Marcos! After all of the furore and with most people still confused over the true position, the cars reformed on the grid for a 20 minute sprint to the flag. It looked like being a walkover for the DeWalt duo with only the Marcos within striking distance. So it would prove, but behind them it was to be a barnstormer. While the two factory TVRs finished the race in fast cruise mode, Michael Caine taking the win in #92 (making Richard Hay a winner on his debut! ), behind this pair there was a real ding dong. A three car train of Martin Short, Piers Johnson and Mike Jordan were pressing each other hard for fourth. The gap to the Marcos ahead was enormous but it was tumbling. Tom Shrimpton was really struggling with a Mantis GTO whose gearbox was self destructing. He had already lost sixth gear and was having to drive one-handed, the other being required to hold the car in fifth, the sole remaining functional ratio. The dice on the track was fascinating but confusing, the order on track was Jordan, Short, Johnson but the aggregated time told a different story, with Piers leading Short and Jordan. Piers had been given the right advice, “Just get right behind him, you don’t need to pass”. This he did, almost welding the TVR to the towhook of the Mosler, as the lap times tumbled again. The three were dicing on track, dicing for position and scything through Shrimpton’s advantage. With lap times in the 66 and 67 second bracket, the hobbled Marcos had no answer and all too soon it was Piers in third, Short fourth and Jordan fifth. 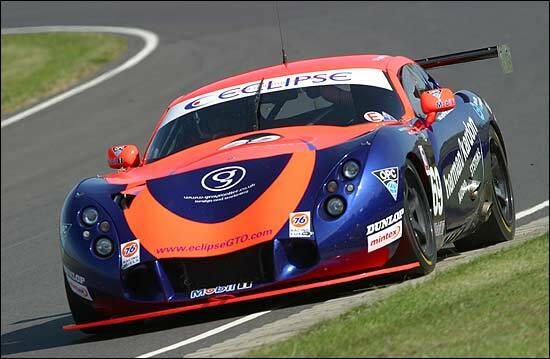 It wouldn’t finish like that though as two laps from home, Piers Johnson found himself in the tyre wall: a rose joint had failed leaving the Eclipse Motorsport driver a passenger, a hard fought podium position had gone and the TVR was left badly damaged. A few late nights ahead for the Eclipse boys!